Asian double-byte languages (Chinese, Japanese, Korean) are excluded from this text expansion because these languages usually do not experience text expansion in the process of translation. In these cases, Déjà Vu X3 Workgroup replaces each word (or double-byte character) with one double-byte character. Some of these languages—for instance, Vietnamese and Thai—may not be supported on a non-native version of Windows 98 or ME. You can export the "dummy" file to verify that the special characters of the target language can be displayed appropriately in the original file format. You can export the "dummy" file to verify whether the usual text expansion can be accommodated in the resulting original format files (this is especially useful for software development files, such as .rc files). 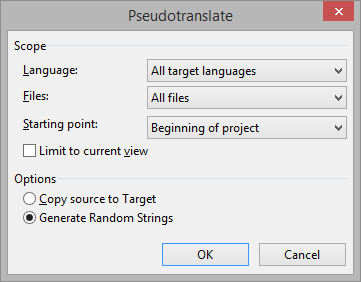 Select Pseudotranslation on the Project ribbon tab. Though none of the "translations" makes any linguistic sense, they can now be used for functionality testing.